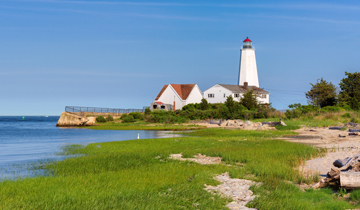 Oceanfront properties, small cottages and vacation homes dot Old Saybrook’s coastline, while single-family houses of traditional and modern design adorn the countryside. The town also features 100 homes of historical significance, as well as many apartment and condominium options. In 2006, Connecticut Magazine ranked the seaside town of Old Saybrook number one among Connecticut towns with a population of 10,000 to 15,000. Attracting thousands of visitors in the summer months, the naturally beautiful town allows for a busy seasonal trade for local businesses. For residents, the town’s parks and recreation department organizes team sports and activities for all ages. For more information about Old Saybrook, contact a Sterling agent today.